Day 1: Arrival and transfer to the hotel where you spend the night. Day 2: After breakfast, transfer from Marrakech to Ait Bougmez by Land Rover. Picnic lunch, overnight at a Berber house at Ait Imi at 1900m. Day 3: After breakfast, we start our trek from Ait Imi toward Ouzirimte through Tizi N'Ait Imi 3100m. Picnic lunch then to Bivouac at 2000m. 6hr walk. 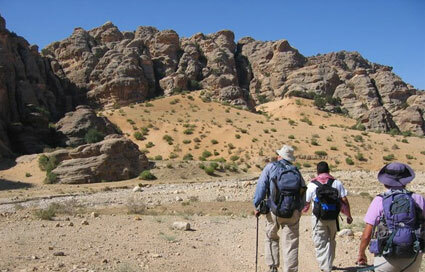 Day 4: We start towards Mgoun gorges, we continue our walk in the river along the Mgoun valley. Overnight in a Berber house at Tiraninmie. 6hr walk. Day 5: After breakfast, we leave Tiranimine towards Aguirzka . Overnight at Berber house or under tent at Imijgag 1800m. 5hr walk. Day 6: After breakfast, we leave Imijgag and head to El Hot, at 1600m. We will pass through the south face of the Mgoun area and volcanic mountains with some Ksours. 5 hr walk. Day 7: Departure from El Hot toward Boutaghrar, meet at our Land rover and return to Marrakech passing through Kelaa Mgouna and Ouarzazate. A visit of Ait Ben Haddou on the road and overnight at the hotel. Day 1: Arrival and transfer to the hotel. Overnight in Marrakech. Day 2: Drive to Ouzoud Cascades where we have lunch. We continue our drive via Azilal to Tabant, the main town in the Ait Bougmez or Happy Valley. Night in the home of a local Berber family. Day 3: Walk along the fertile valley passing small Berber villages to Ait Saidi for lunch. Then continue to Tafenfent (or Ikiz-n-Arous) depending on the weather. 6hr walk. Day 4: Walk over a high ridge, Tarkidit Pass 3300m, to Tilibit-n-Tarkidit, a wide valley where we camp or use a small homely refuge in bad weather. 5hr walk. Day 5: Ascend Mount Mgoun then down to Tizi Oumsoud camp at 2800m. 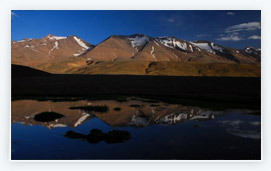 The ascent follows good paths up onto a long and airy broad ridge crest which is followed for several kilometers to the summit with magnificent views to the Atlas in the north and the deserts in the south. 8hr walk. Day 6: Descend the beautifully sculptured Oulilimt valley to camp by Aflafal refuge 2230m. 5hr walk. Day 7: Follow the Assif Mgoun valley passing several Berber villages to the village of Imi Nirkt 2000m. 6hr walk. Day 8: Continue down Assif Mgoun through narrow gorges with many river crossings to Tiranimine village 1770m. 6 hr walk. Day 9: Traveling down river valley following gorges to Igherm Aqdim 1720m. 5hr walk. Day 10: Drive by 4x4 vehicle down the Rose Valley to Ouarzezate passing several oasis and numerous rose plantations. Here we stay in a comfortable hotel, there is time in the afternoon to swim and relax or visit the city and Kasbah of Taourirt. Day 11: Drive up the Assif Imini valley passing Berber villages. An unsurfaced road then leads to Amsouzart village 1800m, sleep in a Berber guest house. Day 12: Walk up the valley to Ifni Lakes 2300m. Relax or swim in lake. 4hr walk. Day 13: Follow Ouagan Valley to Tizi Ouanoums pass 3560m, then descend down to the valley and Toubkal Refuge 3200m where we camp. 7hr walk. Day 14: Climb Mt Toubkal and return to camp. We start the climb at 5am and reach the summit in about 4 hours. Descend back to the camp for lunch and a rest before walking down the Imlil Valley to Imlil village, 1800m. 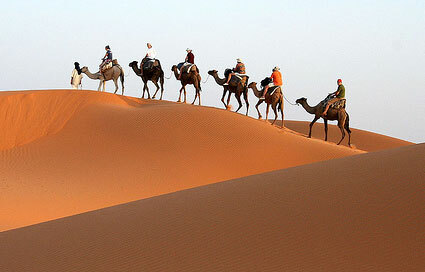 We drive to Marrakech (90 minutes) and our comfortable hotel. 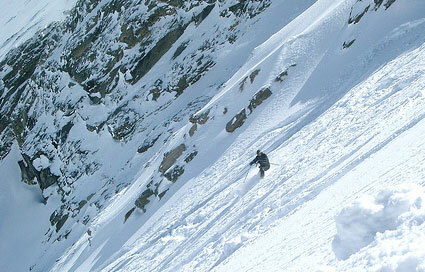 The ascent of Toubkal is non-technical and mainly of reasonable paths. Day 15: Half day tour of Marrakech. Free time in the town in the afternoon.